This is a Partnership Project. LOT enables the steering group to perceive the potential of Political Literacy, and to present this to fellow students and staff in Mullion School. MULLION SCHOOL disseminates and develops the potential of the project to other students through its Citizenship curriculum. With invaluable help from adult community supporters, an energetic, enthusiastic group has opened the doors to Political Literacy, and demonstrated that the whole subject has enormous educational impact. Significant areas of heritage have been revealed, and wonderful relevant links have been forged with other enthusiastic people both locally and abroad. The Lizard’s remoteness often carries disadvantages for all young people – this includes limited opportunities to stimulate and stretch the most able and engaged, as well as opportunities for the disaffected. What the peninsula does possess, is an extremely beautiful location, ideal for an end-of-project conference. The project's aim is to improve people's political knowledge within the local school community. Involved in the project are 4 Mullion School pupils; in the picture with Mrs.Pascoe on the left and Mr.George on the right, we are Tom Seaton, Kate Sherlock, Matthew Cuff, and Emma-Louise Wagstaff. Tony Roberts, Mullion Comprehensive School's PE teacher and Tom Jane, South Kerrier's Outreach Worker and Trustee for LOT are also involved and supporting the group. The project was started in September 2003. So far the group has met with Jacquie Pascoe, LOT's Financial Administrator, Pippa Englefield (Cornwall County Council)Janet Ritchie (Grade-Ruan Parish Council),Dennis Casley ( Mullion School Governor) Andrew George (Local MP) and Pamela Welsh (Mullion Women's Institute). The group has also been on a trip to London where they had an interesting and exiting time. 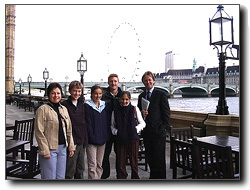 They went to the Houses of Parliament where they met with Andrew George and watched DEFRA question time. The group returned to the Houses of Parliament the following day for a full tour of the House of Commons, House of Lords as well as a tour up Big Ben clock tower. The political Literacy Group also visited the CARE (Caring Campaigning and Communicating) Offices. CARE lobby British and European Parliaments. On their final day there the group visited Barclays Head office and met with David Blake. Here they discussed what they hoped to achieve through the project. The group carried out a series of questionnaires in order to find out the extent of the Student's political knowledge before the group started to inform the school. The results showed that students had a general level of knowledge and it is hoped that similar questionnaires will be carried out during the project to find out the project's impact. 48% could list the three main political parties, 57% knew that Andrew George was their local MP and 80% knew what a general election was. The questionnaire also showed that 76% of students felt that there should be someone under the age of 20 on all councils. The group has already developed a keen understanding of the various levels of government and democracy. It is now hoped they the group will share this information with the rest of the Mullion Comprehensive School and Landewednack Primary School and they are already looking to visit the European Parliament in Brussels. 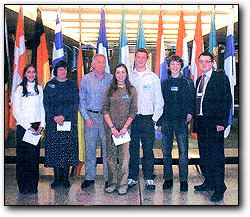 The Political Literacy Group are also keen to develop links with Canadian political systems. 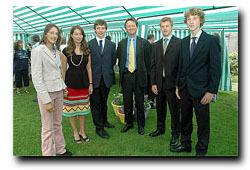 The group also has to do a presentation in June 2004 to Barclays New Future to update them of their progress. Harry Newman will take Matthew's place, as Matt will have GCSE exams. "I really enjoyed London - it was really interesting and lots of fun!" Emma-Louise Wagstaff." Saturday 20th March 2004 we left Newquay Airport and flew to Stansted, we then flew onto Brussels where we were bussed into our fabulous hotel in the Place Louise. We went to the Grande Place that night and ate at Le Roi d'Espagne. It was a lovely place with a stuffed horse in the corner! On Sunday we went around a huge market called the Marche de Place near to La Gare Du Midi it was an amazing market – all the fruit, vegetables and fish were very fresh and there was so much of it! In the afternoon we went on a guided bus tour around Brussels and saw all the famous landmarks including the Expo Exhibition Building. The group were designated with finding the venue for the night’s evening meal. On Monday our real work began and we visited David Fieldsend at the CARE office. We were amazed to find out that David owned a house in Camborne and was instrumental in getting Objective One funding into Cornwall. CARE lobby the European Parliament on potential legislation where there are moral and ethical implications; issues such as cloning and abortion. We then went onto the European Parliament and talked with Stuart Quayle, Dr Caroline Jackson’s Personal Assistant. He gave us a tour of the European Parliament and an excellent talk on the layout and workings of the EU. We met briefly with Dr Caroline Jackson. Our last visit for the day was with South West UK Brussels Office and met with Jake Stafford who explained to us that their job is to make sure that businesses in the South West are aware of the implications of the legislation that is introduced. In the photo are Emma-Louise, Mrs.Ritchie, Mr.Roberts (Project Co-ordinator), Kate, Matt, Tom and Stuart Quayle. Tom Jane also came with us. Quote from Young People: "It was a very enjoyable and interesting trip." Our group of intrepid political literates left the UK on Thursday 21st October 2004 to fly to a part of the old Commonwealth to establish links with the Newfoundlanders. We landed in St John’s, the capital city to be welcomed by our hosts for the first four nights and were soon all warmly ensconced in our billets. 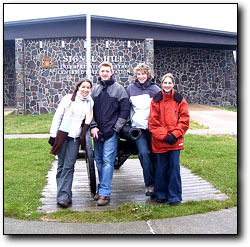 The next morning we all met outside the Garrison Church for our sight seeing tour of Cape Spear (the most easterly point of North America) and the Queen’s Battery and the Cabot Tower on Signal Hill (you can see us there on the photo). This is where Marconi’s first wireless signals were received, sent from our very own Poldhu Cove. In the evening we attended the church youth group before moving on to the Crows Nest (an Officers Mess given to the British Navy) for a 3 course meal and a most interesting talk about The British Commonwealth. Saturday was organised to be a fairly laid back day. We met with Joe Craig a leading member of the St Johns Marconi radio club. This cemented further links between them and ours at Poldhu. We spent the rest of the day with our families in the shopping malls and downtown. The Saturday evening was very exciting for we went to a major league ice hockey game. We had never seen anything like it. The next day we went to early morning service at the Garrison, lunched in family and then went to a wonderful concert given by the Newfoundland Youth Choirs. In the evening Tom Jane, one of our chaperones played the Bodrhan with the Celtic fiddlers in Bridie Molloys in George St. This is the home street of Newfie music.!!!! Day 2 in Port Union was spent in the Elemenatry school at nearby Catalina. Two more presentations and some soccer coaching later we were whisked off for a tour of a million £ shrimp boat. We followed this up with a very interesting visit to the shrimp processing plant. The evening was our big event. We were invited to a very large pot luck supper for about 70 people from the community, our final presentation! The food was amazing and the event was closed with us all being “screeched in” as accepted Newfies. This ceremony involves silly clothes, silly actions, silly sayings, a down in one drink and you have to kiss a COD!!!! We did it!!! We spent our last day as busy as all the others; a visit to see the sailing ship “The Matthew”, a replica of the boat that Giovanni Cabot sailed from Bristol and which fetched up in Bonavista. We then toured the Sir William F Coaker Heritage centre in Port Union. A most fascinating tribute to the man who formed the first fishermens union, became an eminent politician and changed the lives of many Newfoundlanders. That evening we were treated to a marching display and musical concert by the Catalina Sea Cadets, a wonderful end to an amazing few days. We left on the Friday morning to do last minute shopping in St Johns before taking the flight back to the UK. We formed links in both communities and have made friends for life. We have all vowed to return, and we think that goes for the adults who accompanied us; Mr and Mrs Welsh, Tony Roberts and Tom Jane. Quote from Young People: "It was an absolutely fantastic experience for all involved" - Kate Sherlock. It was decided to hold the conference in a series of marquees, a huge undertaking for us. It turned out to be a fabulous decision, for the whole atmosphere and ethos that we created was incredible. It was very, very special and drew lots of appreciative comment. We targeted all pupils in Years 7 & 8 as delegates, a total of 230! It had been decided a long time pre conference that the deliverers would come from recognised experts who had been previously involved in our project, along with others as helpers. The team was delighted when everyone invited accepted to be part of the finale. Andrew George MP, David Fieldsend from Care in Brussels, Mandy Milano & Steve Davies from Common Purpose, Cornwall Youth Parliament, Pippa Englefield, Susie Phillips from Playing for Success, Marconi Radio Club, Kirsty from CSV all presented workshops on various aspects of Leadership. The conference was headed by Rex Hall MBE and Mike Sandford (Headteacher). The event started at 11am with a plenary session. It moved rapidly and smoothly through to 3.30pm; each delegate attended three workshops. The finale was a presentation by the group in the main hall to a huge audience. The stage was wonderfully set up with lots of static displays of photographs and press cuttings about the two year project and with two rolling slideshow projections on white towers of photographs and evaluation comments of each separate aspect of the whole. It was most impressive, as was the closing of the conference with each team member speaking. All delegates completed evaluation questions for us. The whole event climaxed with a sumptuous meal of Cornish products in the marquees. A truly magnificent event to close the project! A huge unexpected outcome of the project came with an invitation from Barclays New Futures to attend a conference in November 2005 at the Institute of British Architects Society in Portman Place, London to deliver workshops on Leadership to adults!! - Tom Jane Lizard Outreach Trust.